They say life begins at 40…sure feels like life is being repeated – in the last few months, I’ve seen My Bloody Valentine, The Wedding Present, The Stone Roses, and now, The Wonder Stuff – all bands I saw in my teens. But back then, things were so much different, all those bands were pretty much in their prime – what does it really mean to be seeing them again now, amongst many others in their middle ages? Back then, it was a surge of bodies crammed together with wide eyes, and with sweat pouring off the ceiling, getting drunk on snakebite. Now it’s a case of shuffling about on a carpeted dancefloor, texting the babysitter, sipping on Pepsi. 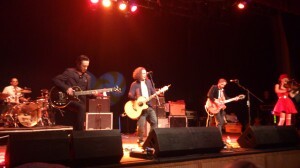 The Wonder Stuff were the first band I ever saw, so it’s them I can blame for enticing me into the world of gig-going. Miles Hunt’s grin is as enigmatic as ever. It’s a different band now. Two of the original members are sadly no longer with us. It’s now an eclectic mix, with the colourful Erica Nockalls on violin, looking like a slightly less shocking My Bad Sister, and new guitarist Stevie Wyatt, a homecoming of sorts for him, hailing from nearby Bridgend, and in fact, a former pupil of my old school. He’s living the dream – The Wonder Stuff were one of his favourite bands from childhood, although he had more the look of someone going through the motions – perhaps it was nerves. The Wonder Stuff were the alternative band even the most staid of office workers could get, “Size of A Cow” and “Dizzy” being staples of any pub disco. They were from just before Britpop, but tonight, they open with two songs that have riffs reminiscent of “Disco 2000” by Pulp, the epitome of that era. They have a good go at the new stuff. They have 3 albums after all for 40-something indie kids to catch up on. Of the new songs, “Friendly Company”, introduced as a song for fans of “Come Dine With Me”, stood out. At least 10 of the first few songs feature new fiddly, Erica. For me, The Wonder Stuff lost it once they ditched the punk edge of The Eight Legged Groove Machine – an unrecognised classic album. However, these days, in the unexpected era of alt-folk, the fiddle is a regular feature for some of the biggest acts (fortunately, The Wonder Stuff stop short of bringing out the ukulele). And so perhaps unexpectedly, The Wonder Stuff in their folkier guise transform themselves into very much a contemporary band. Many of these songs, the likes of “Circlesquare” and “Caught in My Shadow” for example, have aged well, perhaps like the wine Miles Hunt drinks straight from a bottle. Our lead singer is still able to inject fun into the equation – he jokes about whether Port Talbot, a town he confesses never to have played at before in his 25 years on the circuit, has yet to cotton on to the cult of facebook. I’m pretty sure that there are interviews where he regrets having given up on the punkiness of the early sound, and about 2 thirds of the way through the gig, he ushers the love of his life, Erica, with her fiddle, off the stage so that the remaining 4 members of the band can get down to some more serious rock’n’roll. For the next few songs, things get a bit more chaotic with the likes of the classics, “A Wish Away” and “Unbearable”. “Poison”, inevitably closes the set. But all is forgiven come the closing encore, which has a mix of the old and new. The line-up may have changed, but as a musical force, somehow The Wonder Stuff have scraped through unscathed. They’re still a band to warm the cockles. Particularly, the old cockles.